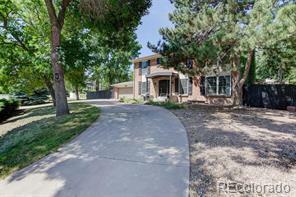 Beautiful professionally updated 2 story brick colonial in the heart of Applewood Mesa. Kitchen is a chef's dream with 2 sinks, wine cooler, Silestone countertops & maple cutting board island. Fabulous backyard entertaining with covered patio, mature trees, basketball hoop, garden & grass space. This spacious home also offers hardwood floors throughout 1st and 2nd floor, 2 fireplaces, 4 bedrooms, bonus room on 1st floor (currently used as office), 3.5 baths, finished basement with Flor carpet tiles and large shed with electricity. Walking distance to South Table Mountain trails for hiking and biking.